A hammertoe is a flexible or rigid contraction usually affecting the second, third, fourth or fifth toe. 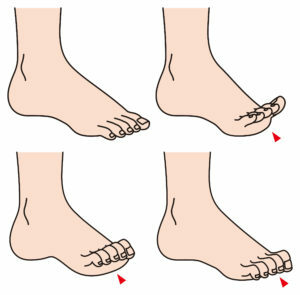 The toe is bent at the middle joint of the toe, resembling a hammer. Ligaments and tendons that have tightened cause the toe’s joint to buckle, cocking the toe upward. Shoes then rub on the prominent portion of the toe, leading to inflammation or bursitis. During the early stages, a hammertoe remains flexible, meaning that it will straighten when pressure is applied to the buckled area. As time passes, the toe can become permanently buckled or rigid. Hammertoes can cause complications such as corns and calluses at the point where they come in contact with the shoes. As with many foot problems, one of the cause of hammertoes can be attributed to wearing improperly fitted shoes. Make an appointment with Dr. Chaudhry as he has a variety of ways to treat hammertoes. Treatment may include better designed shoes with a wider toe box, padding, straps, cushions and or surgical correction.